VMG Health is a one-of-a-kind firm, offering a combination of expertise and comprehensive services that simply cannot be found elsewhere under one roof. This is part of our longstanding commitment to meet the healthcare industry’s unique, complex, and ever-evolving needs. For more than 20 years, since our inception in 1995, VMG Health has provided valuation and transaction advisory services related to over 30,000 engagements, exclusively for the healthcare industry. As the recognized leading healthcare valuation firm, we pride ourselves on our ability to serve as a single source for all our clients’ valuation and transaction advisory service needs. Today, our client base is national and broad in scope, ranging from large healthcare systems to individual financial lending institutions. 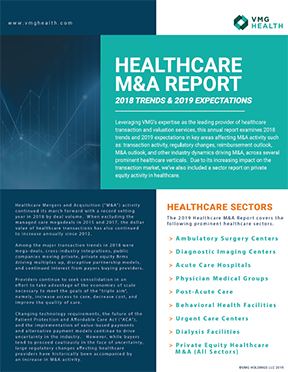 VMG’s Health’s strong market position, extensive contacts, and expert insights – combined with our expanded service offerings — help our clients succeed in the ever-changing healthcare landscape. Our healthcare valuation firm’s more than 150 dedicated professionals have an extensive array of credentials in their respective fields and keep their skills up-to-date through continuing education. Many of our associates also serve as educators, thought leaders and authors through leading national healthcare organizations. With offices in Dallas, Denver, and Nashville, VMG Health is a healthcare valuation firm dedicated to providing trusted leadership and valuation solutions for the healthcare industry.